Software Defined Networking (SDN) has received considerable attention for both experimental and real networks. The programmability of the centralized control plane utilizes the global view of the network to provide better solutions for complex problems in SDN. This results in an increase in robustness and reliability of network functions running in SDN. This paper is motivated by recent advancement in SDN and increasing popularity of multicasting applications by proposing a technique to increase the resiliency of multicasting in SDN. Multicasting is a group communication technology, which uses the network infrastructure efficiently by sending the data only once from one or multiple sources to a group of receivers. Multicasting applications, e.g., live video streaming and video conferencing, are popular and delay sensitive applications in the Internet. Failures in the ongoing multicast session can cause packet losses and delay and hence affect quality of service (QoS). 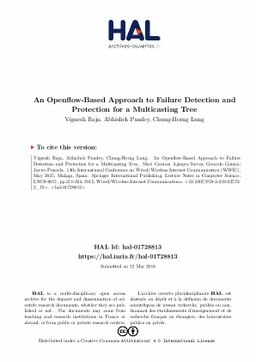 In this paper, we present a technique to protect a multicasting tree constructed by Openflow switches in SDN. The proposed algorithm can detect link or node failures from the multicasting tree and then determines which part of the multicasting tree requires changes in the flow table to recover from the failure. We also implement a prototype of the algorithm in the POX controller and measure its performance by emulating failures in different tree topologies in Mininet.